I am an obsessive compulsive reader and I am addicted to books. People smoke incessantly, drink excessively and feel jittery without weed but, I suffer from withdrawal symptoms without anything to read. Be it a book, magazine, an advertisement on a wall, or even the back of someone’s newspaper on the tube, I’ll read it. After all that reading for 20 something years, I’ve decided to review books seriously. I have reviewed in the past, but mostly on Amazon and occasionally for publishers. 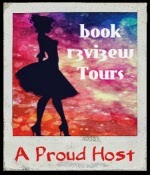 I’ve recently come across a blog tour, Book R3vi3w Tours and decided to become a tour host. I think it was a promising start to my book reviewing days.